Mahler's Eighth Symphony was referred to rather scathingly by Theodor Adorno as his 'official masterpiece'; famous for the vast forces it requires it can sometimes seem like a work calculated to convince simply by dint of its sheer vastness. For Valery Gergiev, then, to have chosen to complete his Mahler cycle with the work, set within the grandeur of St. Paul's Cathedral is understandable. The forces simply wouldn't have fitted in the Barbican but there's never any harm in amplifying the religious elements of the work (Catholicism in Part One, Goethe's Eternal Feminine in Part Two) in such a setting. The baroque theatricality of the performance might well have been overwhelming live but it does not, unfortunately, tranfer onto a universally successful recording. In fact, this is a Mahler Eight with some serious drawbacks. First among these is the recorded sound itself. Although the engineers have managed extremely well to tame St. Pauls' acoustic, they have only done so by obviously artificial means that can be disconcerting. The massed choruses – the Choir of Eltham College, the Choral Arts Society of Washington and the London Symphony Chorus – sound rather distant and hazy and reverberant while the brass players, particularly in Part One, seem to be located in a dryer, sharper acoustic. The vocal soloists, too, seem to float around in a rather indeterminate acoustic space, particularly disturbing when the high-lying lines of Viktoria Yastrebova's soprano are not as well-tuned as they might be. The second drawback, for me perhaps even greater than the first, is Gergiev's ill-advised decision to field a cast of soloists, all but one of whom are members of his Mariinsky Theatre company. Granted, there are some good voices in there – Evgeny Nikitin is an unusually beefy Pater Profundis, for example, even if he goes slightly off the rails at the end of his Part Two solo – but the German we hear in the Part Two Faust setting varies from the phonetically correct but unidiomatic to the alien and incomprehensible (not to mention evidently uncomprehending), as is the case with Sergey Semishkur's Doctor Marianus; the voice is a sturdy instrument but the language is simply not up to scratch. The other soloists can sing the notes but are similarly hampered. Not only might Gergiev's critics complain that this smacks of nepotism but they may also suggest that it provides a convenient metaphor for an approach to Mahler by the conductor that has demonstrated an inconsistent sympathy and feeling for the composer's unique language. No-one could deny, however, that Gergive does an impressive job at marshalling his forces and on the whole he maintains a tight grip on ensemble in what must have been difficult circumstances. The playing of the London Symphony Orchestra is typically fiery and virtuosic, even if the spot-lit brass sound a little rough and ready at times. 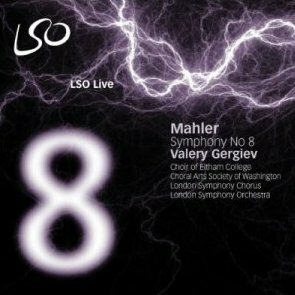 In fact, one cannot but wonder whether the idiosyncrasies of Gergiev's previous Mahler releases have been ironed out in view of the sheer need to keep everyone together. Having to steer this unruly work through the foggy St. Paul's acoustic intact results in one of the most conventional reading in the cycle. Gergiev does come in a couple of minutes under eighty minutes – and therefore fits neatly onto one CD – but it is not a performance that ever feels rushed, either. For the straightness of the interpretation might be a blessing, but it does rather remove the potential for any of the thrills and spills which have divided critics and audiences but, at least, made Gergiev's Mahler such a talking point. Even if earlier performances in the cycle had been consistent in their approach and merits, this Eighth was always going to be an odd-one-out, swapping as it does the close, bright and sometimes constricted acoustic of the Barbican for a space even less well suited to Mahler's sometimes grandiose but more often minutely detailed scoring. The engineers capture many of the instrumental solos very well and the final 'Chorus Mysticus' certainly raises the roof. I also like Gergiev's beautifully hushed introduction to Part Two, and his dramatic instinct is always in evidence. Yet this disc is an imperfect record of an undoubtedly stirring occasion, but one which gave the conductor little scope for interpretation. Those collecting the cycle will not hesitate at LSO Live's modest asking price. Otherwise, with a problematic acoustic and unidiomatic soloists – let's hope those Kirov soloists performing the Ring at Covent Garden this summer get some better language coaching – it's a disc that's difficult to recommend in a crowded field.